Inquisitive students had the chance to talk to a real “success story” from Nelson and Colne College as part of Europe Day. 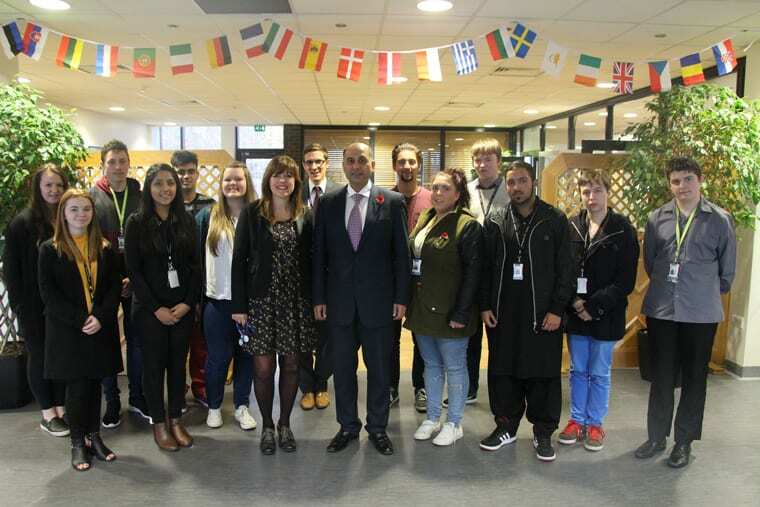 MEP Sajjad Karim spoke to students about achieving aspirations and the role of Europe during the engaging and informative event at NCC. As well as hosting seminars to hundreds of students, Sajjad also spoke to a small group during a lunchtime question and answer session. The College was decorated in bunting for the special event, and talented Catering students also produced some delicious European delicacies as part of the day. Other activities included students hosting a mock referendum outside the College’s Refectory, a passionate student debate and a “Travelling to Europe” student workshop. During his talks, Sajjad described how his career, which involves providing advice to influential figures such as the Prime Minister, all began at NCC, and encouraged students to always believe in their ability. 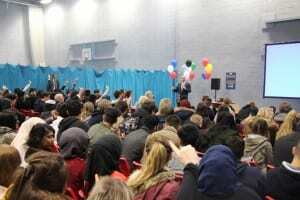 He also urged students to start thinking about whether they feel the United Kingdom should remain in the EU. As part of the day, Sajjad was also given a tour of NCC’s impressive facilities, including the new £2million Engineering department, by Assistant Principals Alison Rushton and Paul Britton. Principal Amanda Melton, who joined Sajjad and students for the Q&A session, said: “Thank you to Sajjad for taking the time out of his extremely busy schedule to return to his roots and speak to students as part of our fantastic Europe Day. Level 3 Public Services student Sam Diggins, 18, added: “It was really interesting listening to Sajjad and hearing what he had to say in response to questions. As well as providing a diverse curriculum, NCC also ensures all students are given opportunities to engage with enrichment days, like Europe Day. For more information about life at NCC visit www.nelson.ac.uk or contact 01282 440272.